Sure, I like the fact that Wisconsin made it easier for active duty military and retired police to get concealed carry permits, but what really makes sense to eliminate senseless violence perpetrated by (bad) people with guns is this: Get caught as a felon in possession, three years in prison. Use it to commit a violent crime, another 5 on top of that. Unfortunately, these are already illegal. It seems a shame that we need to pass laws to get judges and DAs to do their jobs, and send violent criminals away. Portage County, Wisconsin’s Sheriff’s Department is offering concealed carry permit classes. They are also teaching a basic pistol course at the department’s range. Prices are $40 for the CCW class, $25 for the Basic Pistol, or $50 for both. Hopefully we will see more instances of law enforcement partnering with citizens for everyone’s benefit, and supporting our rights. Wisconsin Senator Van Wanggaard is looking for co-sponsors of a bill that would eliminate the 48 hour waiting period to buy an handgun in Wisconsin. This is currently the top of my list to fix WI gun laws, so it would be good to see some action on it. We repeatedly see complaints about how much CEOs are paid when the question of minimum wage hikes comes up, with the implication (or outright claim) that if the CEO and executives were paid less, the minimum wage hike wouldn’t be a problem. After running across one of these, I decided to do a little research. According to Wikipedia, Wal-Mart employs 2.2 million people. If we took the CEO’s pay, in it’s entirety, and distributed it to the employees, they would make for a whopping $11.64 raise. A year. Or a little under six tenths of a cent per hour for full time employees. In fact, if you add up the salaries for the six executives named in the story I referenced for the CEO’s salary, and distributed all of it to the remaining employees, you would get about $32.63 a year more. That’s under 1.2 cents an hour for full time employees. If you were working 10 hours a week, you would see less than 5 cents an hour additional. Keep that in mind the next time someone says we should reduce executive pay to raise the minimum wage. I just got back from a commencement ceremony at UW Madison, and two or three times a speaker mentioned that President Obama visited the campus twice in the last year. The reaction was closer to what I would expect if they mentioned Bush. A very limited number of people cheering, and not for very long. It was obvious that at least one of the speakers was taken aback by the reaction, or lack thereof. Hopefully this is an indication that the younger generation is seeing Obama and the democrats for what they are. I guess we will see in the next few years. Never ask a question you don’t know the answer to. Especially when it’s that obvious. Brewer’s degree? Broadcast Journalism. Not knocking it, but if you are going to demand a degree in economics before someone can comment on a subject a: make sure he doesn’t have one before you bring the snark, and b: make sure you do. Clarke, a black Democrat, is commenting on things like the new race-based standards for discipline in schools. Standards that focus one doling out punishment proportionate to the racial makeup of the student body, rather than proportionate to the offenses. I have commented on this already. Policies that expect people to behave at lower standards often have the result of lower people to those standards. When a group students are allowed to get away with more, the percentage that would cause trouble are allowed to cause more. If nothing is done to correct this, more will join them, either because they think it is alright, or as a “self defense” mechanism. Clarke’s says that the normalizing of bad behavior and lower standards do nothing but hurt the black community. I could not agree more. Edit: CotR picked up on this, too. I just purchased my first turkey hunting permit. Looking forward to trying that, the time slot I have is for mid-May this year. I purchased this a while back to fill the 22 pistol slot in the Must Have Gun List. 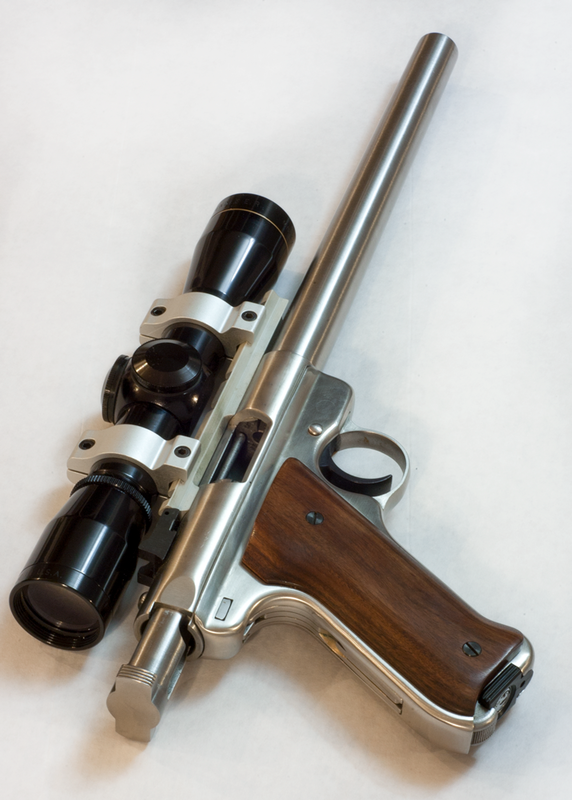 Ruger MK II with a 12 inch barrel and a Leopold 4 power scope.